Weekly Thursday event where I randomly promote one book, movie, and TV Show that I want people to know about! A fantastic addition to the saturated Angel/Demon market! Post apocalyptic, romance, suspense, action…it doesn’t get better than this. I think I read it in one sitting. I absolutely cannot wait for the sequel, World After, which comes out November 19. Penryn is a solid heroine, who isn’t just a whiny damsel in distress. Loved this one! Beautifully made movie with a stunning performance from Emily Blunt as Queen Victoria. Some political intrigue along with a tender romance of Prince Albert winning her heart. Period drama with beautiful costumes, awesome acting, and something of a history lesson 🙂 Another one of those lesser known movies that I want more people to know about. From IMDB: Dominated by her possessive mother and her bullying consort, Conroy, since childhood, teen-aged Victoria refuses to allow them the power of acting as her regent in the last days of her uncle, William IV’s rule. Her German cousin Albert is encouraged to court her for solely political motives but, following her accession at age eighteen, finds he is falling for her and is dismayed at her reliance on trusty premier Melbourne. Victoria is impressed by Albert’s philanthropy which is akin to her own desire to help her subjects. However her loyalty to Melbourne, perceived as a self-seeker, almost causes a constitutional crisis and it is Albert who helps restore her self-confidence. She proposes and they marry, Albert proving himself not only a devoted spouse, prepared to take an assassin’s bullet for her, but an agent of much-needed reform, finally endorsed by an admiring Melbourne. Battlestar is BRILLIANT. Yes it’s Sci-Fi. No, there are not weird looking aliens. Yes, there are robots. But there are also a lot of really legit military/legal/political plot lines, plus a huge cast of fascinating characters. It’s dark, gritty, grim, and yet so brilliantly written, with very high production quality. I can’t recommend it enough. From IMDB: It’s been 40 years since the 12 colonies of mankind have heard from their progeny, the Cylons — robotic creatures who rose up and declared war on their masters, then disappeared. In a sudden, devastating strike, the Cylons return and lay waste to the colonies, aided by human-looking Cylon variants and an unwitting fifth columnist. The attack forces Commander William Adama to call into action his museum-piece warship, the Battlestar Galactica, and soon its company of hotshot fighter pilots is blasting away at the invaders. But their best efforts can’t prevent the colonies’ obliteration. 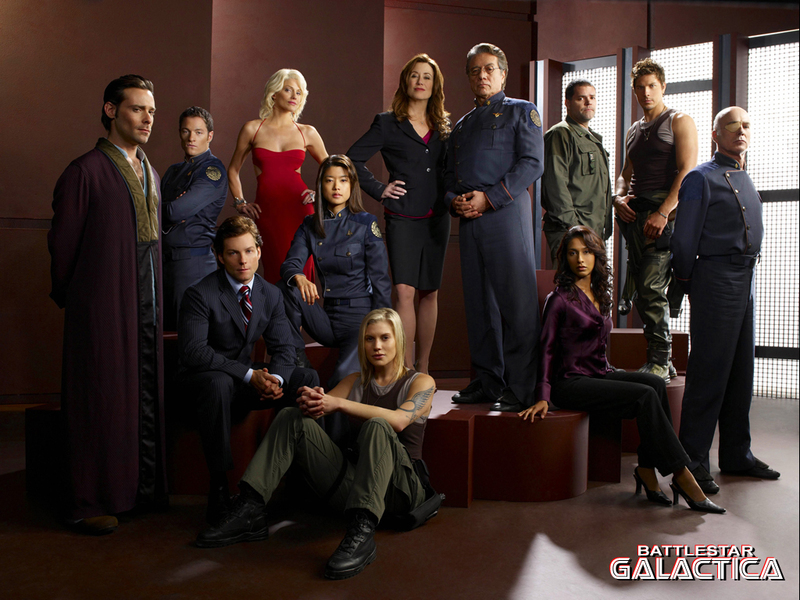 Fleeing the Cylon genocide, the Galactica leads a rag-tag fleet of survivors on a lonely quest to find humanity’s fabled 13th colony — a planet known as Earth. This entry was posted in Random Promotion Thursday.